Quality headphones can be stylish and good-looking at the same time. Most of the Bose products correspond to both of these requirements, which makes the company’s products particularly attractive. Bose SoundTrue In-Ear headphones are great for even the most demanding active individuals. Here are the main reasons why. Deep and clear sound is crucial for music lovers who like to work out. Bose has focused on this primary benefit without sacrificing style or design modernity. The design is quite attractive and customers can choose between black, white and cranberry headphone varieties. The set also comes with a carry bag in the same color as the main tone of the headphones. Bose relies on quality materials, which give the headphones a sleek appearance. The durability and ruggedness of the headphones are also guaranteed. You’ll find them tough and functional, even if you like to exercise in harsh conditions or practice extreme sports. Headphones for athletes often don’t stay in place but Bose has dealt with the issue through its StayHear technology. In addition, the headphones come in three sizes for a perfect fit. Very high sound quality: the sound remains perfectly balanced regardless of the volume that you choose. The distortion is going to be minimal, even if you enjoy very loud music. 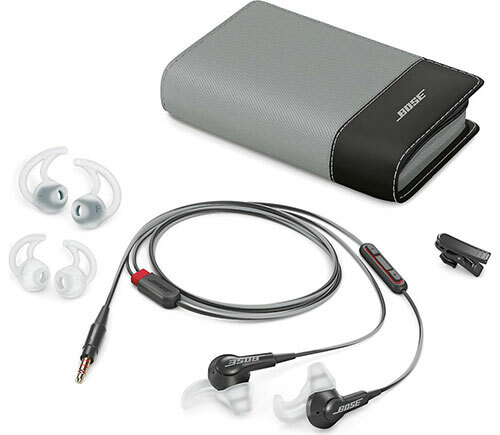 The Bose TriPort technology delivers a “natural” sound, which has given the headphones numerous five-star ratings. Headphones stay in place regardless of activity: is there anything more annoying than constantly having to fix your headphones while exercising? The StayHear silicon add-ons that the headphones come equipped with will keep them in place throughout the workout session. Reduced ambient noise: the headphones provide reasonable insulation against ambient noise. Easy to use remote: the in-line remote is particularly useful for taking calls or switching between listening to music and taking a call, even if you’re in the middle of a particularly intense cardio session. Excellent price to quality ratio: the features of Bose SoundTrue In-Ear headphones is comparable to that of much more expensive active headphones. You’ll get a ton of great features without having to spend extra money. Android users have some phone call difficulties: phone calls using Android devices could be a bit challenging at times. Android smartphone users typically have to make additional adjustments. Stiff cord: several customers have complained that the cord is way too stiff and it gets in the way during training sessions. The headphones, however, come with a built-in clip that can be used to overcome the problem. Bose SoundTrue In-Ear Headphones deliver natural, satisfying sound. Whether you like to listen to silent or loud music, you’ll get to immerse yourself in the spectacular audio quality. The headphones will remain in place even if you like to practice intense sports. Finally, the Bose team has put some hard work in the design. The headphones are stylish enough to turn into a great workout accessory. All of these characteristics turn Bose SoundTrue into an excellent pick for all active music lovers.